Hi WPlus9 friends! Lea Lawson here, and I am super excited to have a guest post on the WPlus9 blog today! 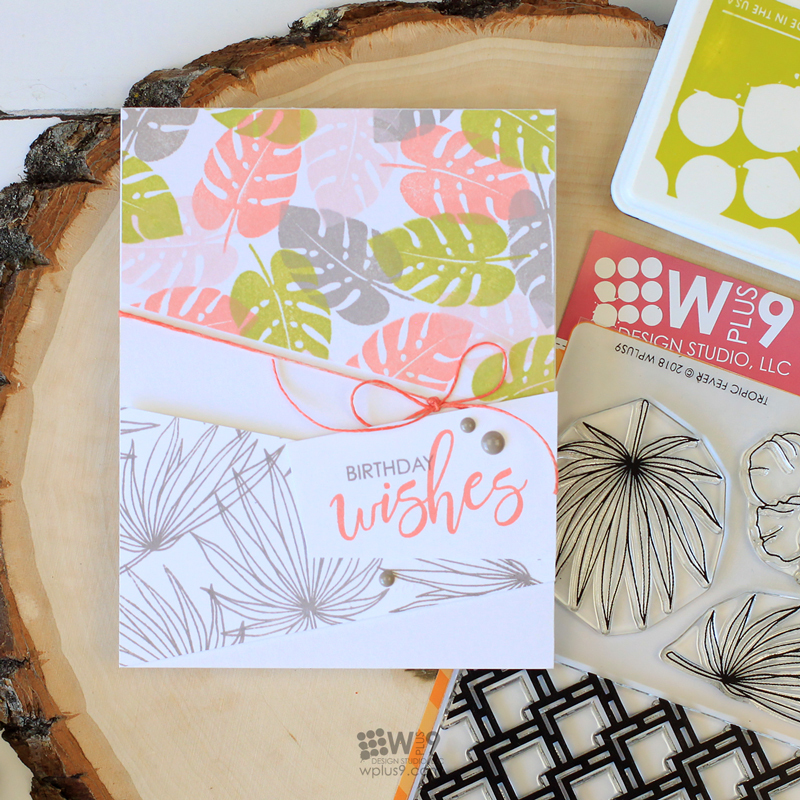 I’m a big fan of WPlus9 stamps & dies and can’t wait to share my projects with you today! One of my favorite things to do is mix my older items with newer items to freshen them up! I took a fairly long break from the crafting world to deal with personal things in my life, which left a lot of beautiful items I purchased unused. 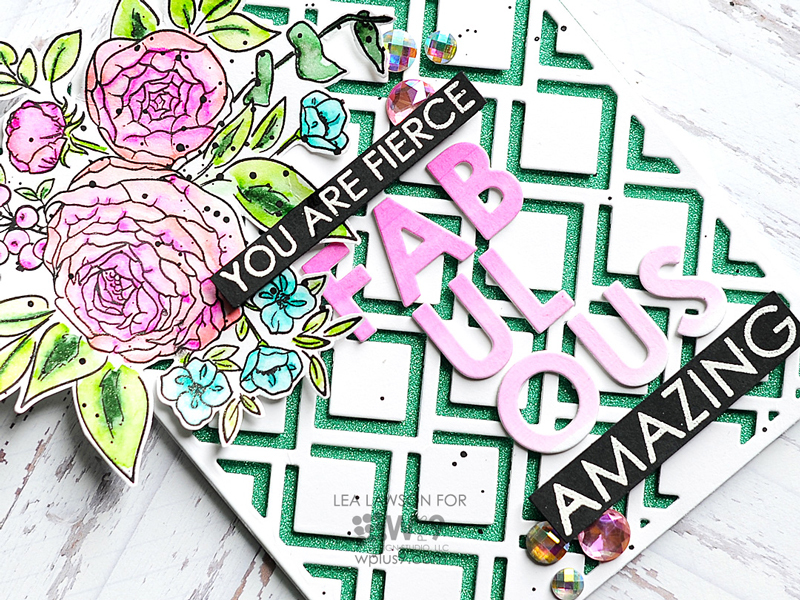 For my cards today I have combined Beautiful Bouquets: Ranunculus with the following items from the two newest releases: the Trellis Background 1 Die, the Fierce and Fabulous stamp set, the Fabulous Die, and the No One Else stamps and companion die. I started by stamping the flowers twice onto white cardstock, then applied watercolor loosely to them. I wanted to see the difference between two watercolor mediums, so I used watercolor pens on the first card and liquid watercolor on the second. I felt like I was able to get the loose watercolor feel better with the liquid watercolor than with the pens. Once the watercolor was dry, I applied shimmer to them with my Wink of Stella glitter pen and then fussy cut them. Then I applied a pink & aqua ombre wash of liquid watercolor to panels of white cardstock. Once it dried, it was time to do all the die cutting. 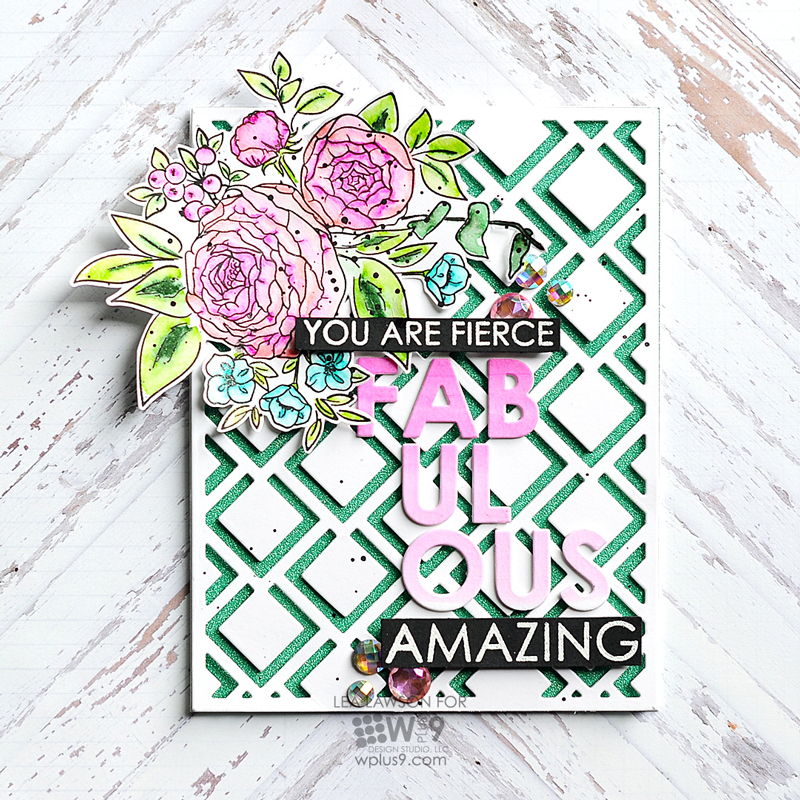 I die cut the word "Fabulous" from the pink wash, the phrase "Thank You" from the aqua wash, and the Trellis Background from white cardstock twice. Next, I stamped & heat embossed the rest of the sentiments in white on black cardstock and trimmed them into thin strips. Finally, it was time to start putting the cards together. I added glitter paper blocks to the front of two A2 card bases, then mounted the trellis backgrounds to them with foam adhesive. I added the die cut words to the front of each card, using the opposite color of the glitter paper. Then I added the watercolor florals to each corner. I covered the die cut words to protect them while I added some black paint splatters to the front. Once the splatters dried, I finished by adding the rest of the heat embossed sentiments to the card fronts. And finally, I added my signature jewels tucked here & there. I hope that you liked my cards today, and that I inspired you to break out some of your old with some of your new! Thanks for joining me today! Have an awesome day! Hello! I hope you all had a wonderful weekend. Did you find some time to get creative? I did and I'm still exploring all of the fun ways to use the newly released sets. 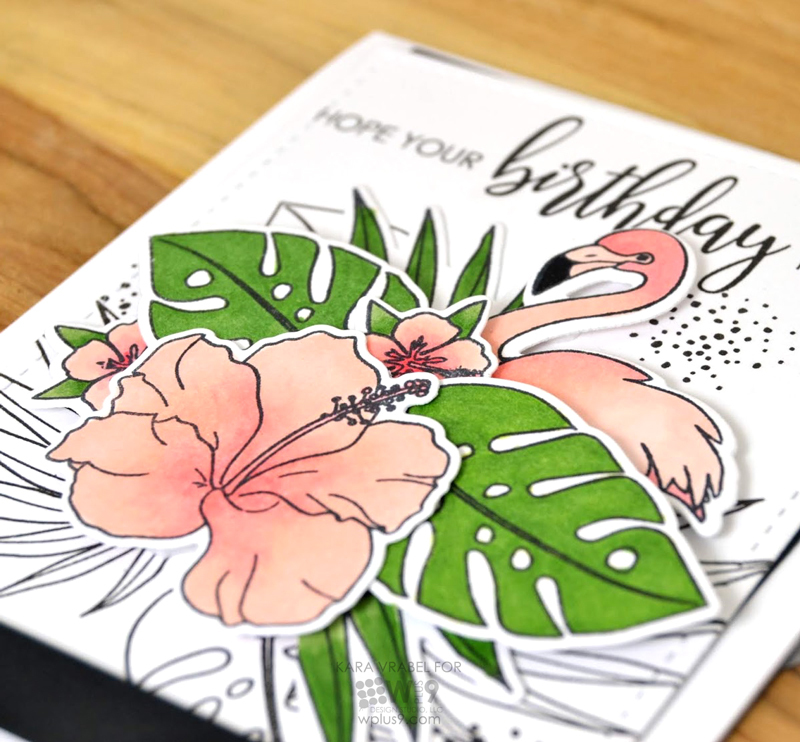 Today's card mixes soft pink, bright green and bold black images in a design that really speaks to my style. I love the uncolored lined images stamped in the background. 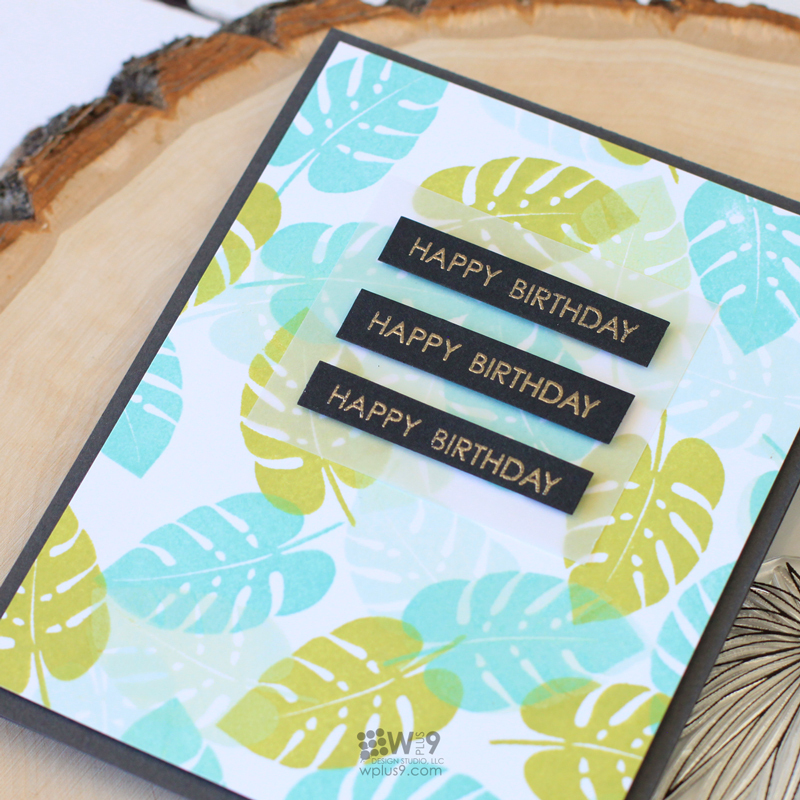 I used leaves from Tropic Fever and also used the dot cluster stamp from And Many More. On top of that I placed Copic colored images in a cluster at different heights for dimension. In among the leaves and hibiscus flowers I nestled a pretty pink flamingo from Flock Yeah! I cut off it's legs (that sounds terrible!) so that it appears to be sitting among the tropical foliage. Everything pink has a coating of clear Wink Of Stella for a subtle shimmer. 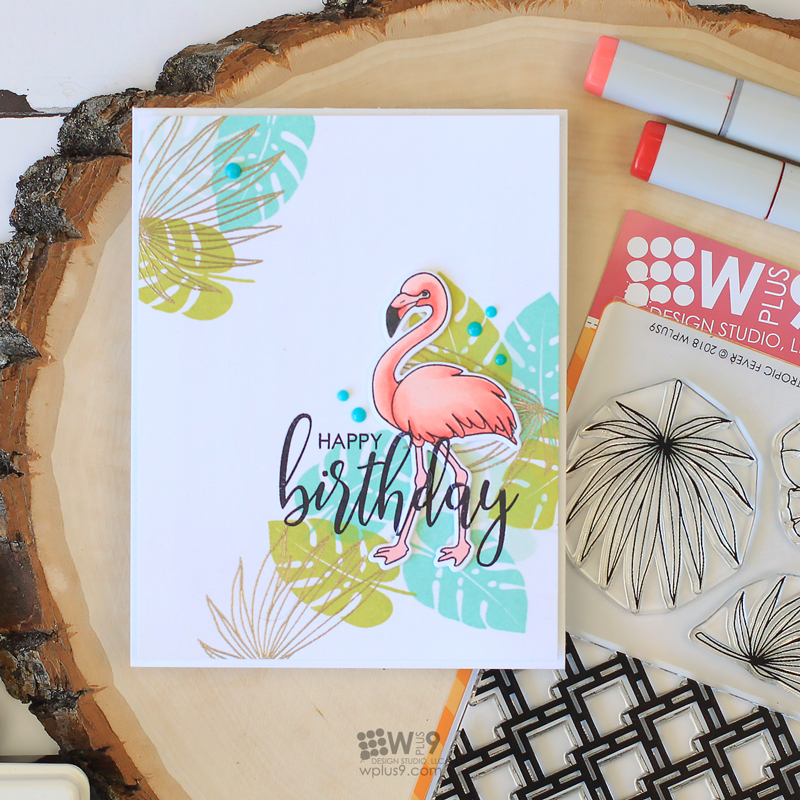 I finished it off with this awesome stamped sentiment from the Birthday Wishes stamp set. I love it! I can't seem to get enough of black cardstock. It brings such contrast and gives a design a lot of 'pop'. I can't remember the last card I created that didn't use black. I'll have to challenge myself not to use it next time! 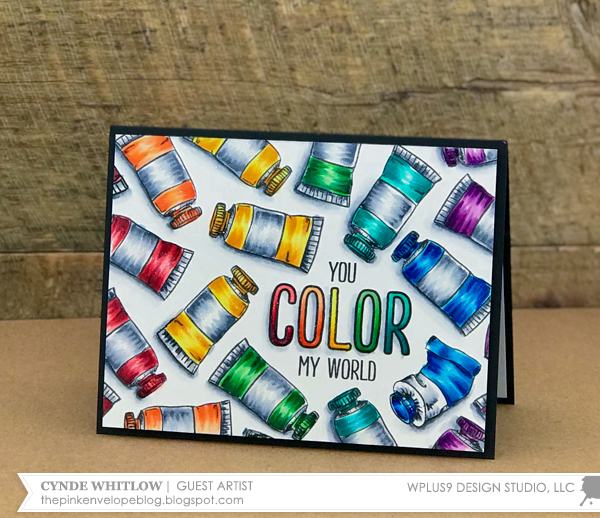 Cynde here, and I’m so happy to be back with another Guest Design post for Wplus9! 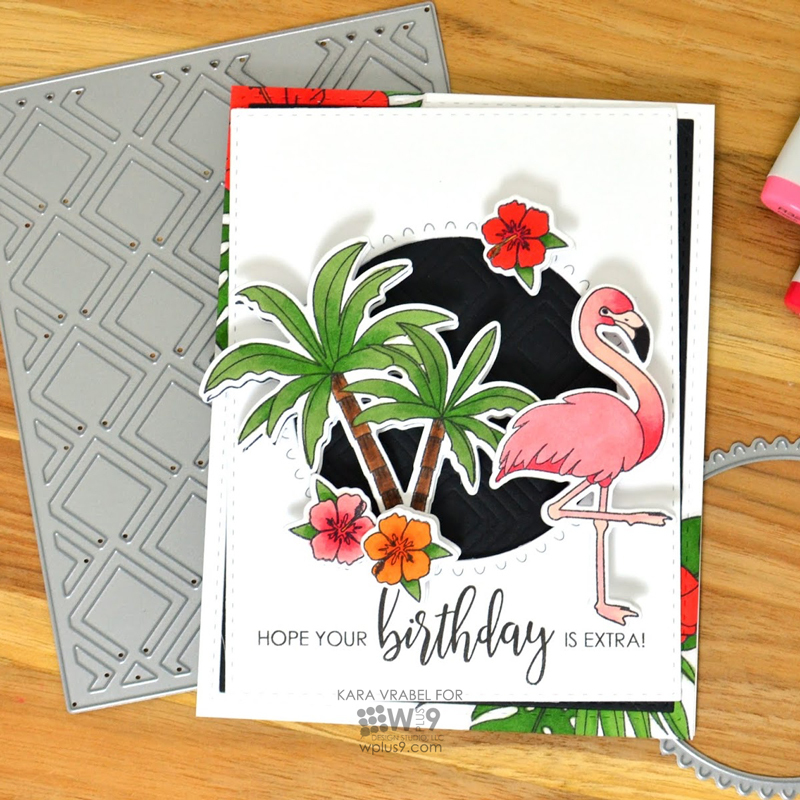 For my card today, I’m stamping a simple background, coloring it in and finishing it off with a drop shadow. I think adding drop shadows is one of the easiest and coolest ways to finish of a card. In fact, I think it makes such a huge difference that I rarely make a card without one. 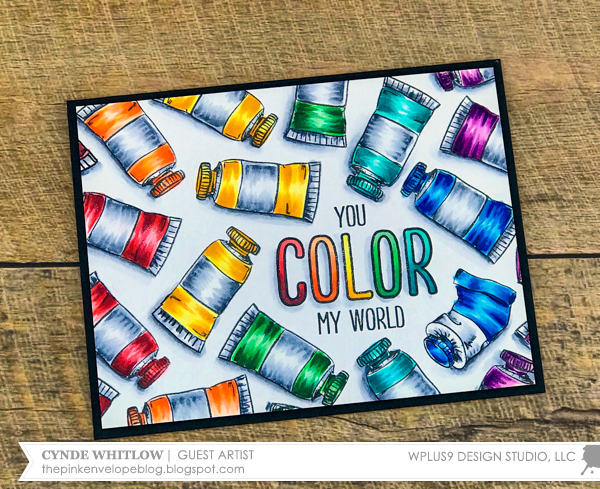 I wanted to use the Color My World Stamp Set for a couple of reasons. For starters it's super cute! Also, I like the size and shape of the images. I knew that I wanted to stamp a pretty simple background on my card panel and these were perfect! The paint tubes aren’t symmetrical, but the lines of the image are mostly straight and that helps a bunch when stamping a full background! You can watch the video below, where I walk you through the whole process. I started by stamping the sentiment on a 4” x 5.25” piece of white cardstock. I stamped the sentiment and the one bent tube first then built the background around that. Since I was going to be coloring with Copic’s, I used a Copic friendly ink. Before I started coloring, I used a pencil and I lightly noted on the panel what color I wanted each tube to be. I knew that I wanted them to be in rainbow order, but I wanted to make sure that the colors would be pretty even across the panel. After I had the panel colored in, I wanted to add a drop shadow to each of the tubes. 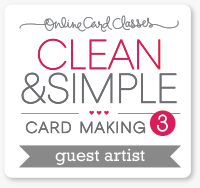 Drop shadows are hands down the easiest way to finish of your cards. You could skip it if you like, but I think adding a drop shadow gives your images or scene a more finished look. I colored all of the tubes in as if they had a center light source, but I added the drop shadow as if my light source was in the top right. When you have a background as busy as this your light sources don’t necessarily need to match. The eye can take it all in as a whole, but it won’t rest on anything in particular that tells you that your light sources don’t match. More importantly what you will see is that your finished card will look three dimensional. That’s my favorite part! 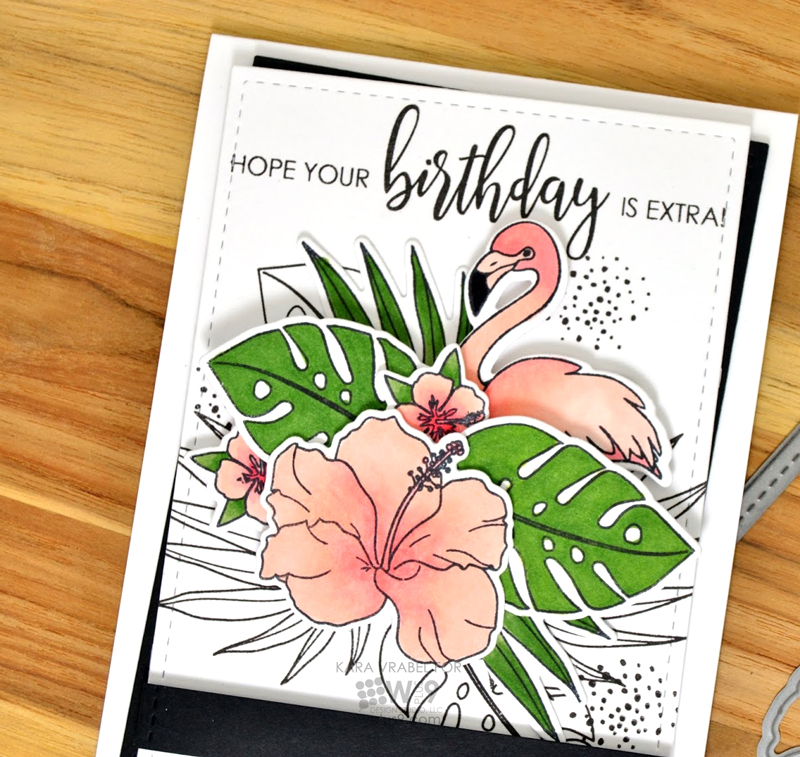 Since I feel that adding drop shadows are a nice finishing touch to my cards, I typically skip adding any embellishments. However, what’s a card without a little (or a lot) of glitter? So I did add a bunch of glitter to the highlights on all of the images. 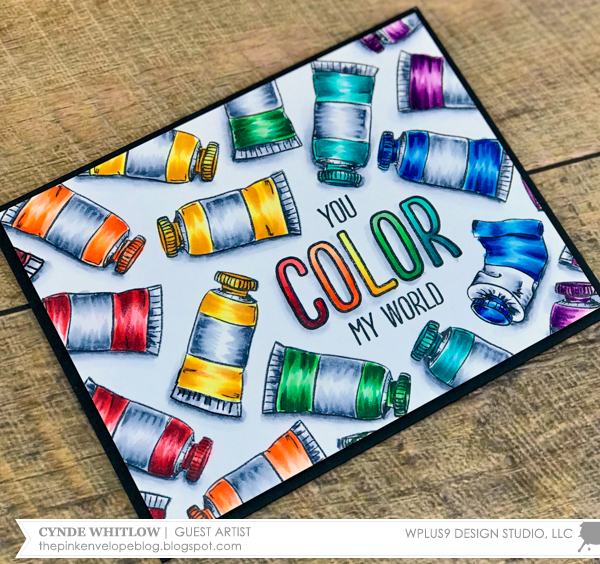 I think black and rainbow are perfect together so I adhered my card panel to a top folding notecard of Wplus9 Black Cardstock and called it good! That’s it! Easy peasy. I hope you enjoyed my card today and as always I enjoyed being here for Wplus9! Hey Guys! 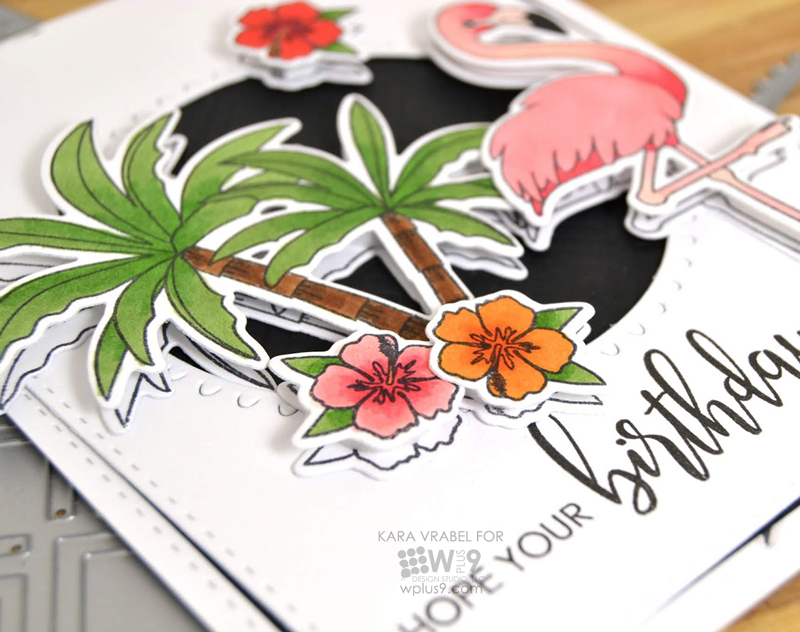 It's Kara and I'm back with another project featuring tons of new release products. The main focus is on Flock Yeah!, but many other sets play a supporting role. I used this cool circle die from Oh My Gostrich! to create a window as I like to do. I feel like it just helps to ground my focal images into a little scene. It also gives me an opportunity to give a little peek at something interesting, but subtle in the background. In this case it's the Trellis 2 Die. I used it as an embossing plate rather than a cutting plate by using embossing mats in my die cutting machine. The result is this really fun texture! I used the cool new sentiment from Birthday Wishes as a platform for my flamingo to stand on. I often double up my die cuts and adhere them together with dimensional adhesive. I love the dimension and the look you get from the side! I hope you've enjoyed today's project! Thanks for stopping by! Hey Guys! 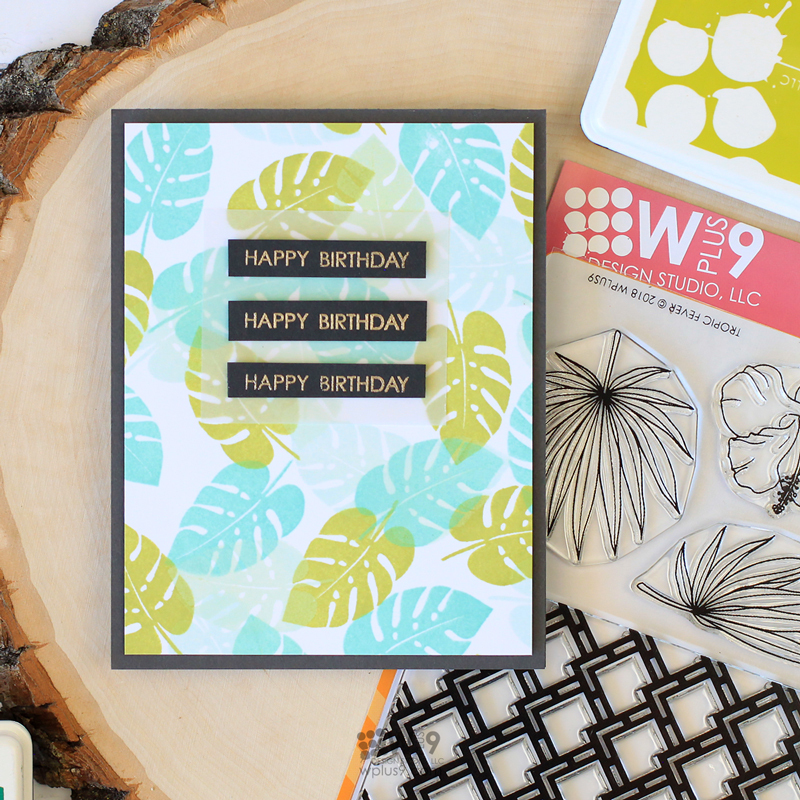 I've got a couple of DIY patterned paper cards to share with you today. I have a love/hate relationship with patterned paper. I adore pattern and could look at patterned paper all day long! But, I can never use an entire pad of paper. And then some is just so pretty that you hate to cut into it. So it quickly gets out of control and becomes a hoarder situation for me. LOL And I don't have the space to be a hoarder! This is one of the many reasons I love stamps. I can create my own "on-demand", just what I need at the moment and in the exact colors I want! No waste, no hoarding, no anxiety. Win-win! 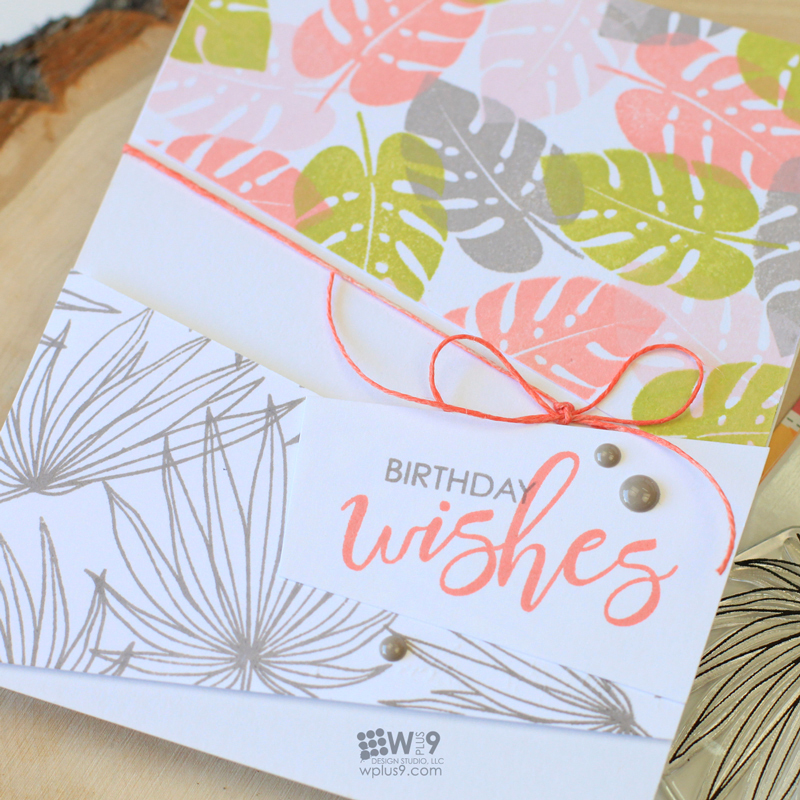 For the first card I created a fun colorful pattern of Monstera leaves using the Tropic Fever stamp set. I stamped the solid Monstera image randomly in Shell Pink, Flamingo, Warm Wool and Last Leaf to create an all over tossed pattern. I created a second pattern stamping the palm fronds in another tossed pattern in Warm Wool. I cut each piece on the diagonal to create a more geometric layout. 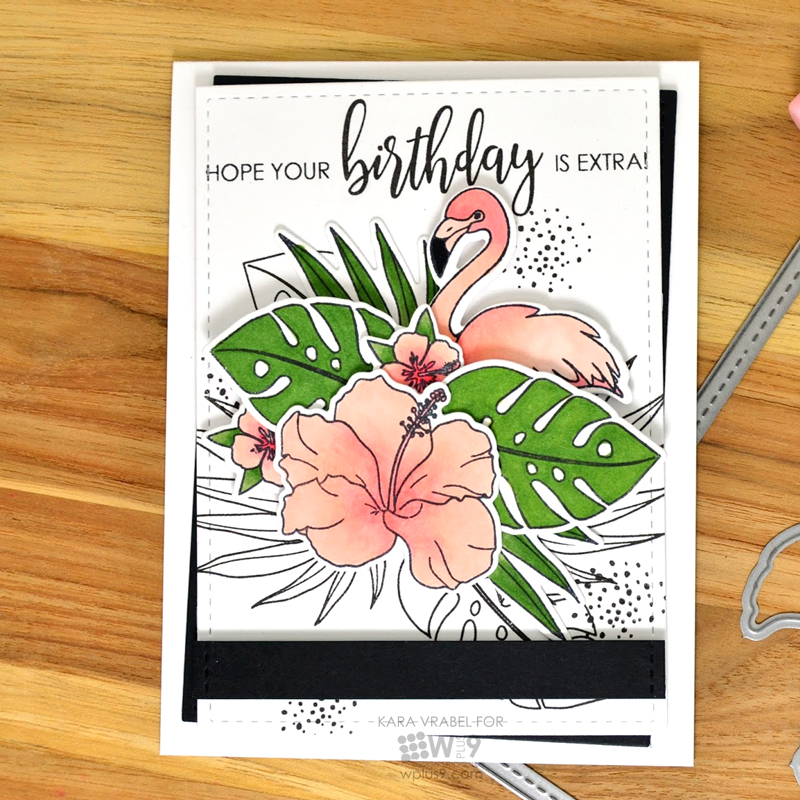 I stamped another piece of cardstock with my sentiment from the Birthday Wishes stamp set. Again, I did some biased "wonky" cutting to mimic the angles of the background. I popped one of the background panels and the sentiment panel up on foam tape. I added a piece of twine for texture. This was just a piece of natural twine that I colored using a Copic marker in a matching color. I was really digging the pattern, so I decided to create a second using a color palette of blue/greens. This time I chose Sea Breeze, Ocean Drive and Last Leaf. 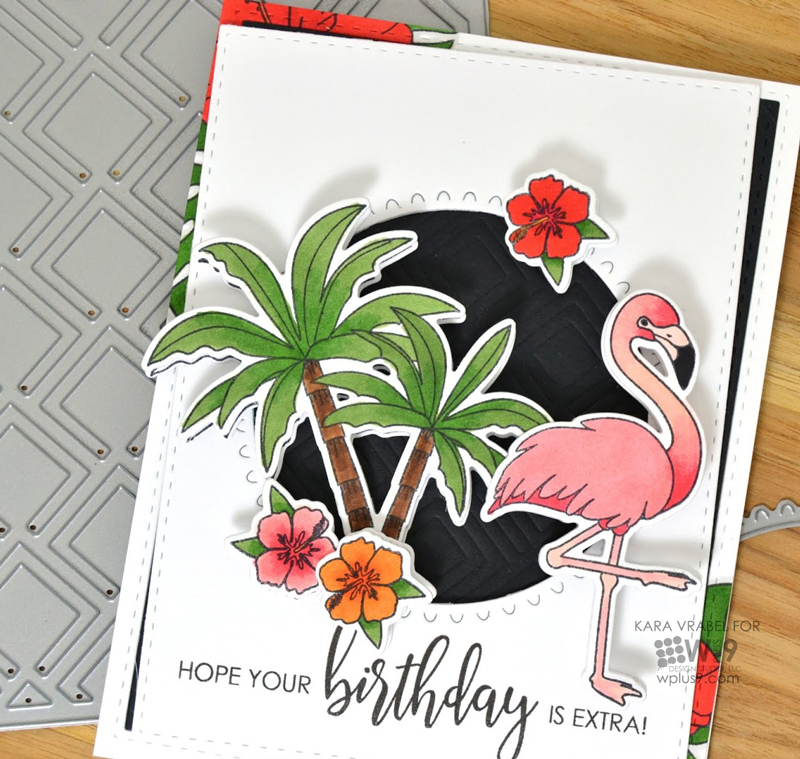 I heat embossed my sentiments on Black cardstock in Ranger Liquid Platinum embossing powder using the Birthday Wishes stamp set. I backed them with vellum and adhered everything to a Coal Mine card base. Easy-peasy. The last card is not a pattern per se. But each design kind of spun one off of the other, so I thought it made sense to share it as well. I really liked the way the Liquid Platinum embossing powder looked with the blues. And when I had the previous cards done and laid out, I loved the colors together. So I created a kind of hybrid. I stamped the leaf pattern in the blues in opposite corners of my card panel and then heat embossed the palm image sparingly. 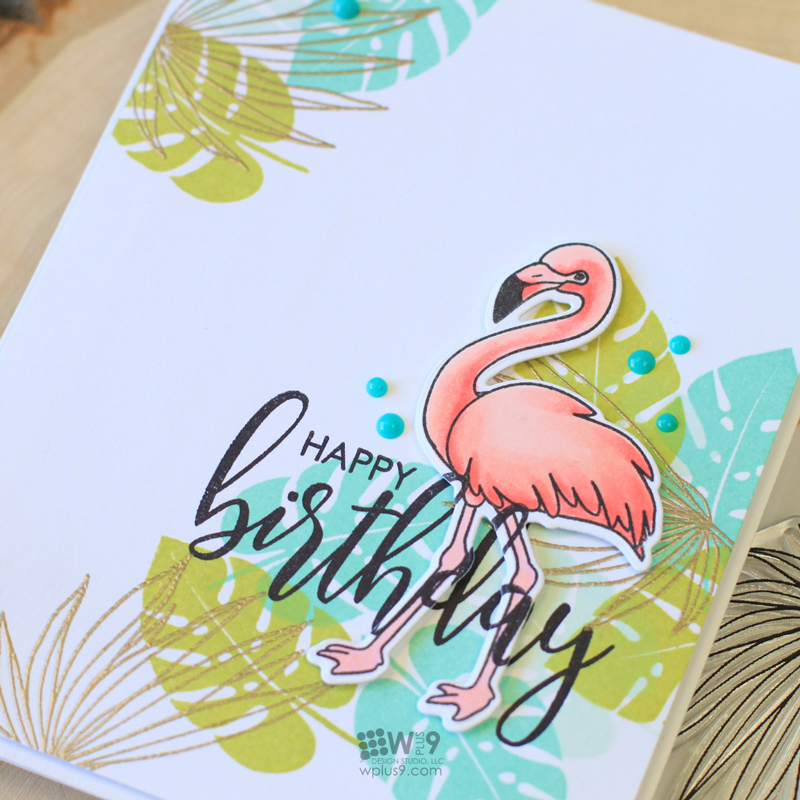 To incorporate the corals, I stamped, colored and die-cut a flamingo from our Flock Yeah! stamp set. I added him...or her, to the bottom right hand corner along with a stamped sentiment also from the Birthday Wishes stamp set. A few Nuvo Drops finished it off. 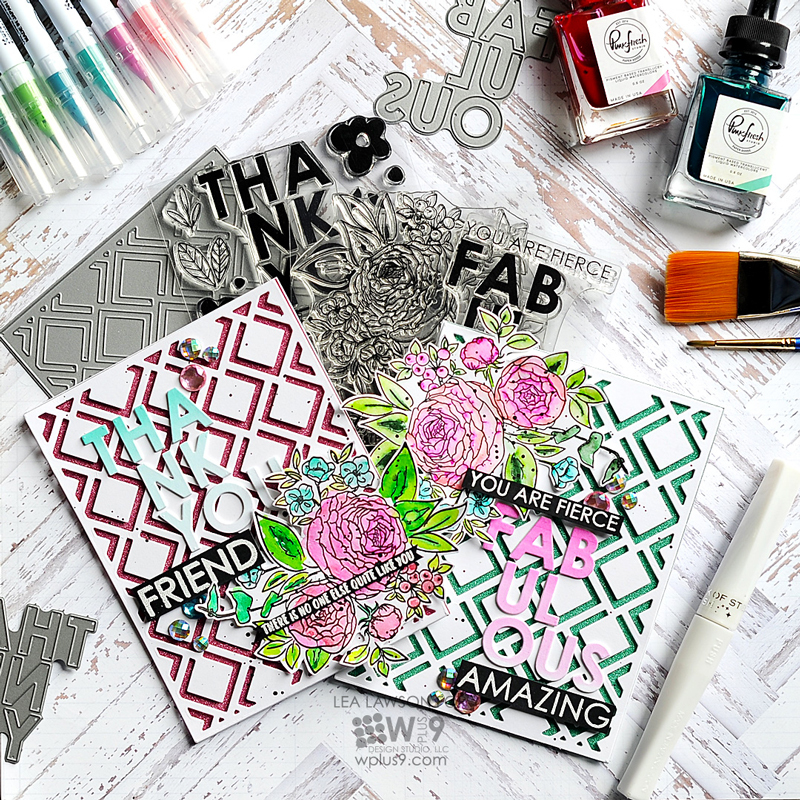 I do really love how these turned out and hope to get a chance play around with these stamped patterns in unexpected color palettes soon. How about you? I wanted to thank everyone for joining in the giveaway for The Daily Marker's 10th 30 Day Coloring Challenge. Congratulations to the lucky winner Carolyn's Blog! Please contact me at customerservice@wplus9.com to claim your prize.